It’s time to reveal the Motorcycle Momma Blog 2016 Annual Trip location. This year we will be riding in August to San Diego, CA for the First Marine Division Association Reunion. For those of you who don’t know, my husband Frank is a former Marine. 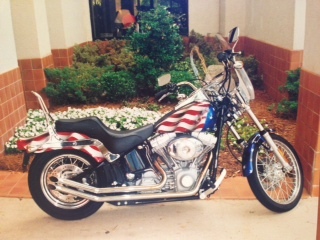 His Marine buddies actually gave me my road name, Wonder Woman, when I rode to Raleigh, NC for a reunion in 2002 on my Harley painted like the American Flag. One of the Marines took this picture and entered it in a photo contest and won 2nd place. This entry was posted in Blog, On The Road Again and tagged lady riders, motorcycle trip, Texas Hill Country., women bikers, women on bikes. Bookmark the permalink.